Travel-NEPAL.com, The Ultimate Site On NEPAL - Places To See - Kathmandu. The Newars are regarded as the original inhabitants of this majestic valley, but their origins are shrouded in mystery. They speak Newari language and their physical features range from distinctively Mongoloid. Kathmandu Valley has long been a cultural and racial melting pot with people coming from both east and west. This fusion has resulted in the unique Newari culture that is responsible for the valley's superb art and architecture. Kathmandu was once run and ruled by Malla Kings during 1600s and 1700s. The unification of Nepal in 1768 by Gorkhas King Prithivi Narayan Shah singled the end of the Kathmandu Valleys fragmentation. Nepali language spoken by the Khas of western Nepal, replaced Newari as the country's language of administration. Surrounded by the green hills, Kathmandu Valley is about 25 km from east to west and 20km from north to south. It lies at the height of 1300m. You can see Kathmandu Valley clearly while you are fly in. This valley is specially known for growing rice corn, wheat and vegetables. However, nowadays this valley is increasingly dependent on imported food and fuels. All the rivers drain towards the center of the valley and join the Bagmati river. Geologist have confirmed ancient myths that claim the valley once lay under water. The Kathmandu Valley has the pleasant climate most of the year. Although there are forests, snow is unheard of and the monsoons are nowhere near. Between October and March it can become quite cold at night and the days become short, although its sunny and warm between mid-morning and afternoon. In April things start to heat up and there are often storm in the afternoon. Still today, Newars form the largest single group in the valley as well as in smaller towns and villages. Bahuns, Tamangs and Chettris live on the surrounding hills. People living in Kathmandu Valley are mostly Hindus and Buddhist and they are very much related to each others religion. People living here speak Newari and Nepali mostly. In Kathmandu Valley majority of people are Hindu and fall under a caste system, although there are still second majority of Buddhists. This valley is full of temples, shrines and stupas where both Buddhists and Hindus go for their regular praying. Nepal is the only country where people worship Gods of all religion. Kasthamandap House of wood which gave Kathmandu its name. Hanumans statue marks the entrance or dhoka to Kathmandu's old Royal Palace and has given the palace its name. The place was originally founded during Licchavi period , but as it stands today of it was constructed by King Pratap Malla and his Queen. Nasal Chowk means dancing one and the courtyard takes its name from a small figure of dancing Shiva. Inside the nasal chowk, there is a large statue of Narshigha, The Kabindrapur Temple, Pancha Mukhi Hanuman Temple, Basantapur Tower, Mul Chowk, Degutaleju Temple, Mohan Chowk and Rana museum. Swoyambhu, the Buddhist temple is situated on the top of a hill west of the city, is one of the popular and instantly recognizable symbols of Nepal. The temple is also known as the monkey temple after the large tribe of monkeys which guards the hill. Although you can get to the temple by vehicle, and save yourself is by far the best way of approaching Swoyambhu. 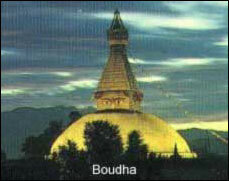 This huge stupa is surrounded by other famous temples and gompas. 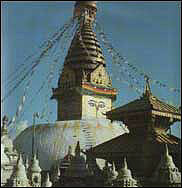 The great thunderbolt which is known as vajra is on the edge of the stupa was built during the Malla kings period. On the top of the stupa is a gold-colored square block from which the watchful eyes of the Buddha gaze out across the valley in each direction. The question mark-like nose is actually the Nepali number ek or one is a symbol of unity. Pashupati Temple is is one of the most important and world renowned Hindu temple stand on the banks of Bagmati River , between the airport and Boudha. This Shiva temple on the subcontinent draws numerous devotees, sadhus and holy men from all around the world. Lord Shiva is known as the destroyer and creator of the Hindu religion and appears on many forms. Although Shiva is often bloodthirsty god, no animal sacrifices are made here. Outside the temple you will see numerous people selling flowers, incense and other offering materials. In-front of the temple there is a bull known as Nandi facing towards the temple. Only Hindus are allowed to enter the temple and you are not allowed to take photographs of the Lord shiva inside the temple. Bagmati River Bank on the side of Pashupati, is also a popular place for cremation. Normally you see visitors taking videos and photographs around this place. Just beside this temple lies Guheyeshwari temple where you will seen Hindus removing their shoes before entering. Just north of the airport and an interesting walk from Pashupati, is the huge stupa of Bouda and is one of the largest stupa in the world. This place is mostly surrounded by Tibetan Buddhists. Prayer services are held in the surrounding gompas and as the sun goes down the community turns out to walk around the stupa. You should always circle around the stupa in a clockwise direction. While entering the surrounding gompas, do not forget to remove your shoes and get permission before taking photos. Make sure that you do not step over the monks cushions. Enter quietly and stand by the main entrance during the ceremonies. These gompas are decorated with impressive mural paintings and thankas. The wheel of life is represented in the porch of every gompa. Listed here are the name of the gompas surrounding Boudha.